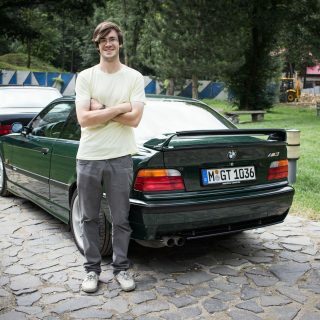 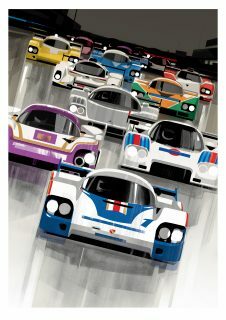 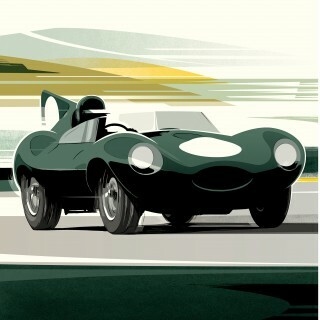 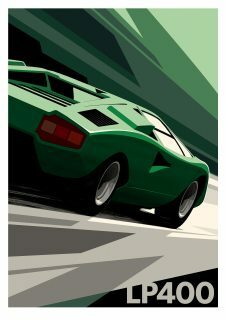 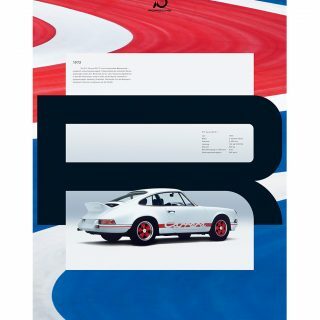 Guy Allen is an experienced illustrator whose background in graphic design has played off his interest in interesting cars to give us a collection of artwork that’s among the best contemporary stuff out there, done on canvas or computer. His medium is modern, but the pieces always keep an appropriate tint of vintage in their atmospheres—not old-timey or antique or anything like a fake gift shop treasure map, but just enough nostalgia harnessed in the choices of colors, each car fitting in so well with its minimalist setting that you can easily mistake them for in-period promo posters drawn in-house. 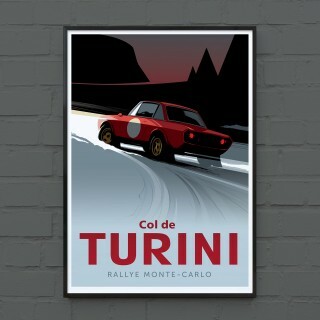 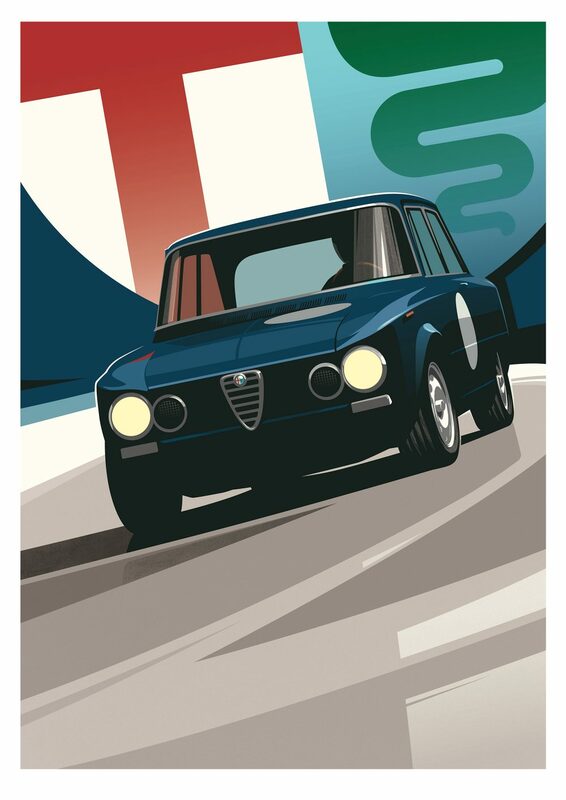 We’ve just added the Giulia Super and the Gmünd 356 coupe to our collection of Guy Allen’s artwork in the Shop. 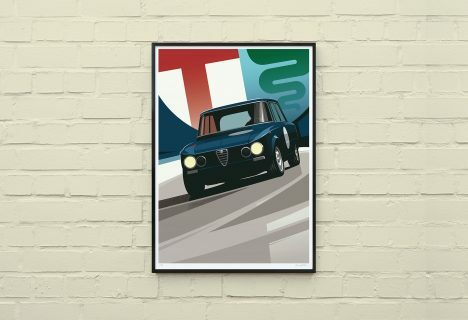 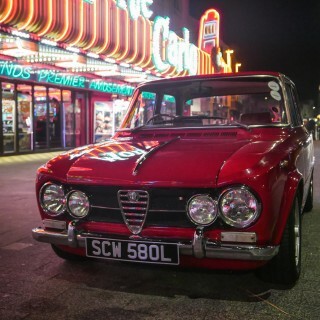 Back in 1965 there really wasn’t a well-developed concept of the sports sedan as we know it today, but when Alfa Romeo took their production four-door Type 105 and adapted elements from their racing kit to build a street-legal Giulia Super they got everyone aiming in the correct direction. 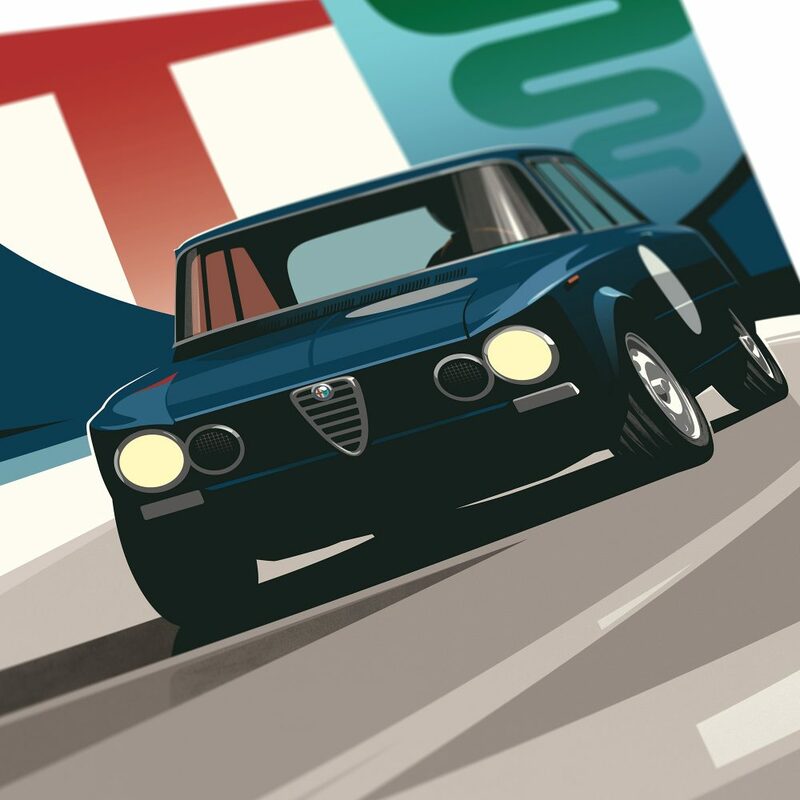 With twin Weber 40s feeding a light and feisty twin-cam mounted in a chassis with upgraded suspension and four discs attached to it, the upright and cute but humble car turned into something closer to a mean little factory hot rod. 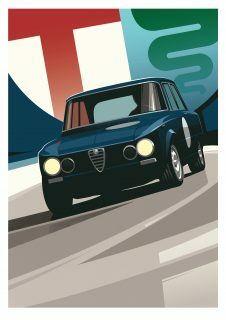 Guy Allen’s rendered the Super in front of the Alfa Romeo cross and serpent and thrown it all a little askew to match the actions of the driver using the car properly, and the combination of the less-common blue with the contrasting meatballs and headlights is a nice alternative to something like a more typical red or white that would have bled too much into the badge in the background. 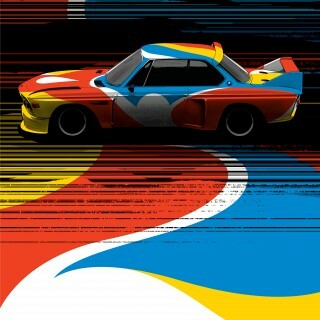 A clean piece for a handsomely simple car. 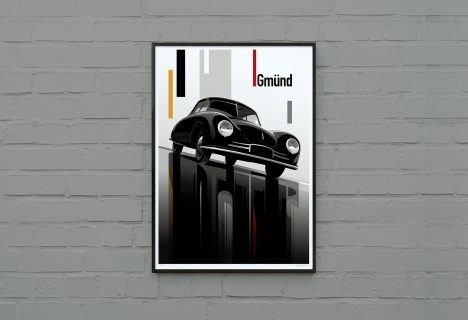 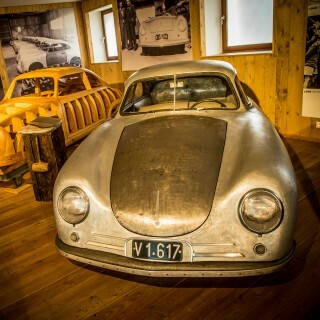 Very much like the Beetle that it shares a great deal in common with, the Porsche 356 is one of those cars that can flit between looking adorably innocent and being one of the most menacing things on four wheels save for something made for the military depending basic things like color. 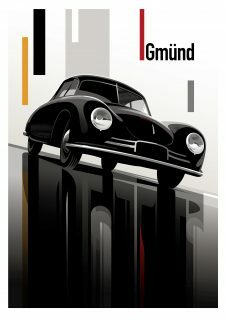 A black split-window Beetle doesn’t need fighter jet looks and spikes (sorry, “aero”) all over its bodywork to possess a certain element of terror (granted, political associations are anything but a null factor in this case), and an early Porsche 356 built in Gmünd before they moved back to Germany and added more bumpers and frills to the design is also a pretty serious looking automobile. 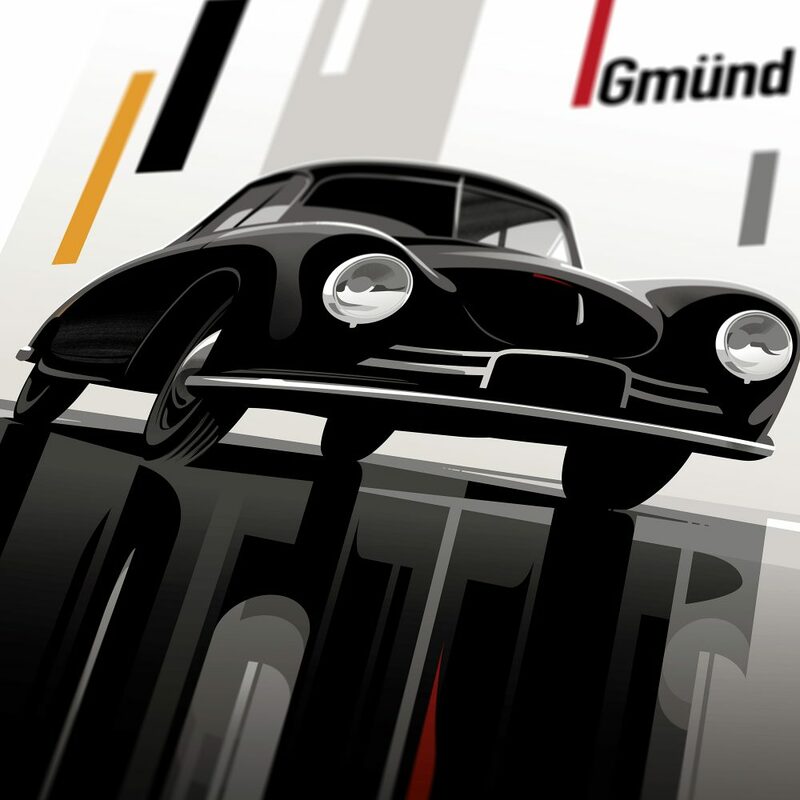 A quaint-sized sports car with a little flat-four and a bunch of bubbly curves shouldn’t look this sinister, but in black it could easily play the role of Darth Vadar’s anachronistic leisure ride. The stark black and white background that Guy Allen’s used here—commissioned as cover artwork for the September 2018 issue of the PCA’s Panorama—is a thoughtful complement to both the lack of color in the specific car chosen here as well as to the very frank design of the Gmünd 356 in general. 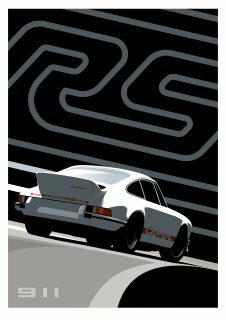 The rectangles of color add welcome accents to break up the otherwise greyscale piece, and they add the German flag into the mix without doing it outright or overbearingly so.